On August 20, 2012, a court in Hefei, Anhui, found Gu Kailai (谷开来), wife of former Chongqing Communist Party Secretary Bo Xilai (薄熙来), guilty of murdering Neil Heywood (尼尔伍德), and gave her a suspended death sentence. It also found Zhang Xiaojun (张晓军) guilty and sentenced him to nine years imprisonment. For a detailed chronology of censorship in that case, see this post. On September 24, 2012, the Chengdu Intermediate People's Court found Wang Lijun (王立军), former Deputy Mayor of Chongqing, guilty of bribe-taking (受贿 - 9 years), abuse of power (滥用职权 - two years), defecting (叛逃 - 2 years), and “bending the law for selfish ends,” (徇私枉法 - 7 years) and sentenced him to a term of 15 years imprisonment. The following is a timeline of the events and censorship leading up to Wang Lijun's conviction. Wang, then police chief of the city of Jinzhou in northeast China's Liaoning Province, first meets Bogu Kailai. April: While Wang was serving as the chief of Chongqing's Public Security Bureau, one of Wang's immediate family members was transferred to a working position in Beijing. Not having a residence in Beijing, Wang's relative received two apartments in Beijing bought by Xu Ming (徐明), board chairman of the Dalian Shide Group Co. Ltd. (大连实德集团有限公司)at a price of 2.85 million yuan (449,583 U.S. dollars). The apartments were registered under the name of Wang's father-in-law. After the deal, Wang gave his thanks to Xu in person. August 12: Bo Guagua (薄瓜瓜 - son of Gu Kailai and Bo Xilai) tries to meet with Wang, but Wang refuses. November 12: After a discussion with Bogu Kailai, Wang arranges surveillance and control efforts targeted at Neil Heywood under the pretext that Heywood may have committed drug-related crimes. November 14: Bogu Kailai and Zhang Xiaojun, then an employee of the general office of the Chongqing Municipal Committee of the Communist Party of China and a family assistant for Bogu Kailai, poison Heywood at the Lucky Holiday Hotel in Chongqing. November 15: After talking on the phone with Bogu Kailai, Wang is informed that she had met Heywood in the hotel and had a drink with him. Wang instructs Guo Weiguo, then deputy chief of the Chongqing's Public Security Bureau and a close friend of Bogu Kailai, to handle the case, but does not tell Guo or other policemen that he possesses clues and recorded evidence of Bogu Kailai's involvement. January 28: Wang reports to Bo Xilai that Bogu Kailai was highly suspected in the murder of Neil Heywood. January 29: Bo Xilai rebukes Wang and slaps him in the face. Wang subsequently asks Wang Zhi (王智), Wang Pengfei (王鹏飞), and Li Yang (李阳) to go to his office and rearrange the November 15, 2011 case file. February 2: Wang Lijun's is removed from his position as chief of Chongqing's Public Security Bureau. Around this time, three staff members working closely with Wang are put under illegal investigation. February 6: Under the pretext of discussing business, Wang cancels his original work arrangements and enters the U.S. Consulate General in Chengdu at 2:31 p.m.
February 7: Wang leaves the U.S. Consulate General in Chengdu of his own volition at 11:35 p.m.
At 10:54 on the morning on the 8th, the Chongqing city government's press office used Xinhua's official Weibo to publish information saying "Based on information, Deputy Mayor Wang Lijun is, pursuant to agreement, currently undergoing convalescent therapy for long-term work overload, high levels of mental stress, and severe physical indisposition. 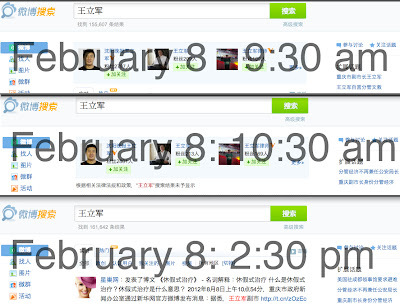 These screenshots show that Sina Weibo was not censoring searches for Wang Lijun at 9:30 am on the morning of February 8, then an hour later it began censoring, then it stopped censoring again after the Xinhua announcement. 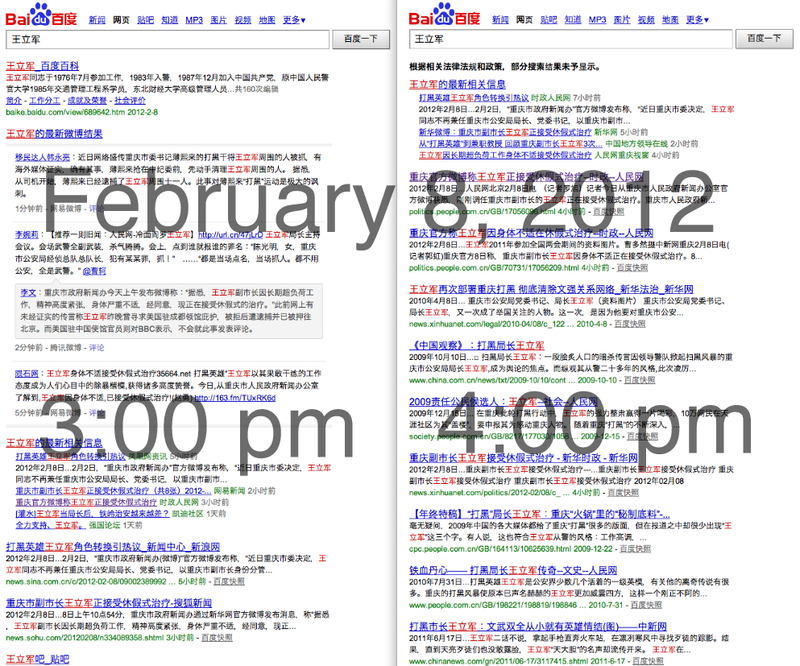 Below, the left-hand screenshot shows that at around 3 pm a search on Baidu for "Wang Lijun" was returning apparently uncensored results. 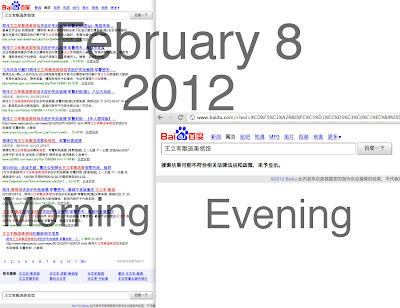 The right-hand screenshot shows that, about an hour later, the same search on Baidu returned a notice saying "In accordance with relevant laws, regulations, and policies, some search results have not been displayed." (根据相关法律法规和政策，部分搜索结果未予显示。) Search results were restricted to about dozen websites operated by the central government and the Communist Party. 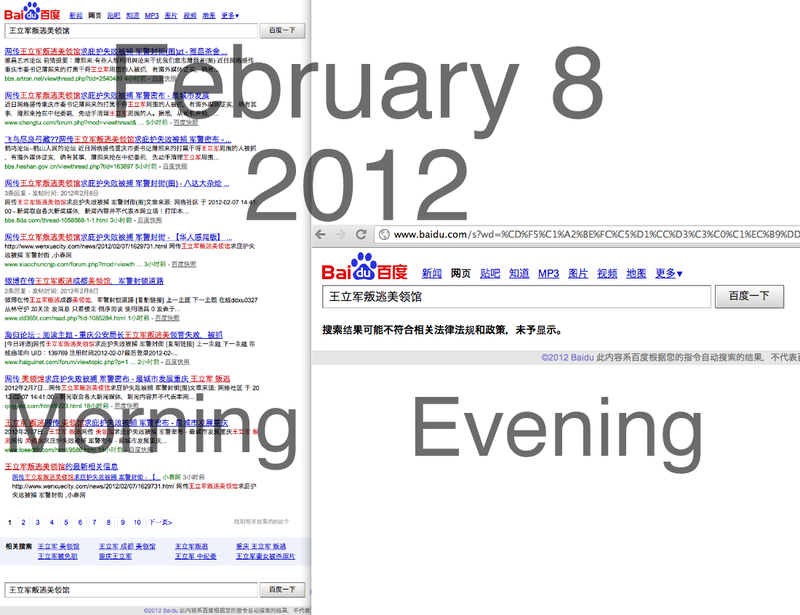 These screenshots, also taken on February 8, show that whereas a search in the morning for "Wang Lijun defects to American Consulate" (王立军叛逃美领馆) returned hundreds of results, the same search that evening returned no results, just a notice saying "Search results may not comply with relevant laws, regulations, and policies, and have not been displayed." (搜索结果可能不符合相关法律法规和政策，未予显示。). By the time everyone reads this letter, I'll probably either be dead or detained. I want to take a moment to explain to the world why I did all of this. There is one basic explanation: I do not wish to see Bo Xilai, the greatest hypocrite in the Communist Party, be able to continue his act. If evil politicians like him rule the state, it will be the greatest catastrophe for people of China and the greatest misfortune for China's future. 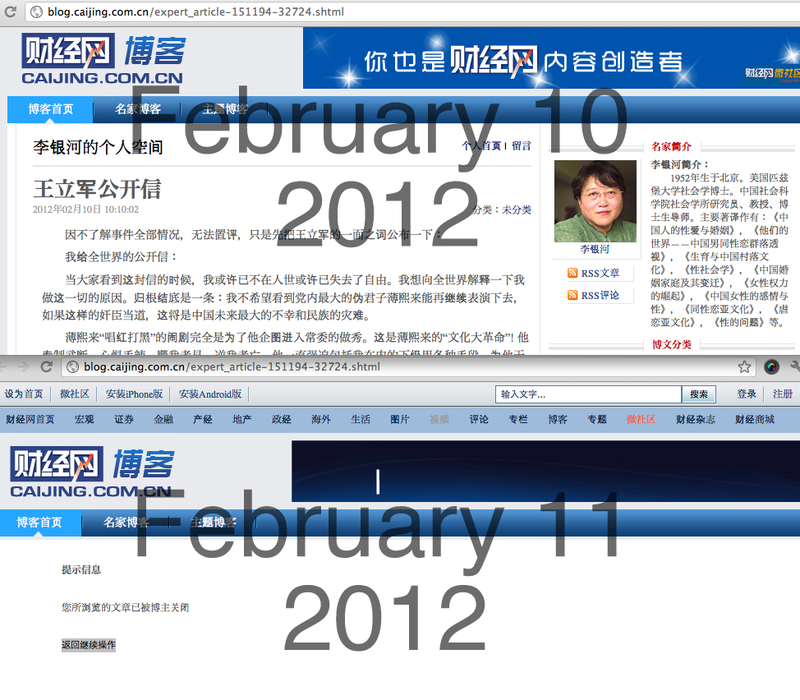 These screenshots show Lin Yinhe's blog post as it appeared before and after it was deleted. 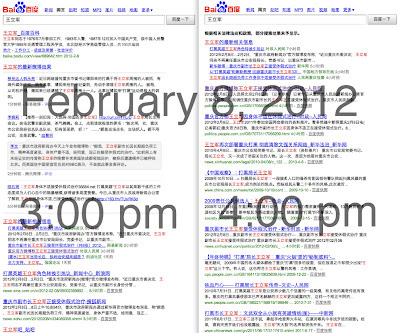 Below, the top-left screenshot was taken on February 11, and shows that on that day a search for "Wang Lijun Open Letter" (王立军 公开信) on Sina's Weibo returned over 1,700 results. 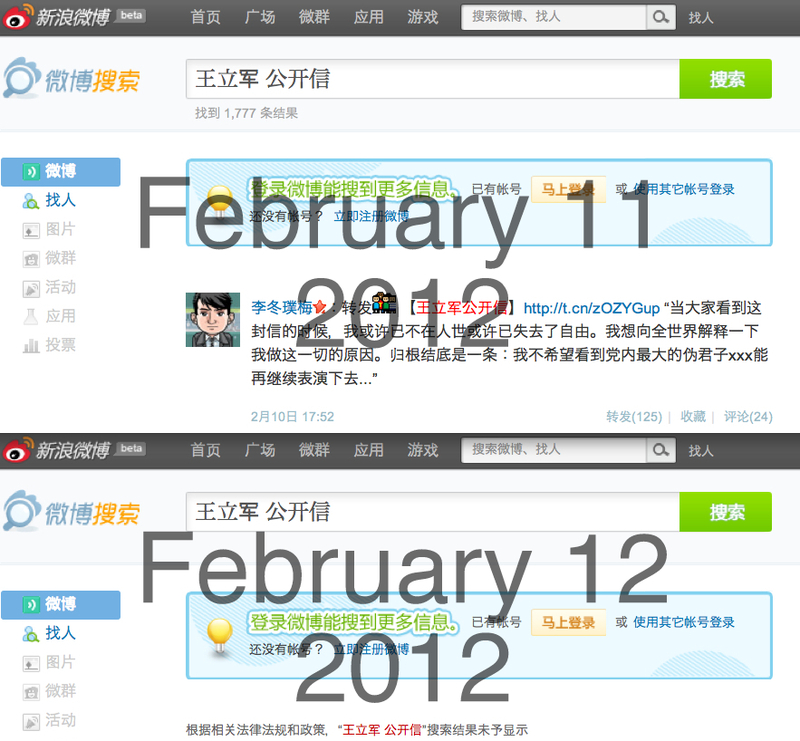 The bottom left and right-hand screenshots were taken in the morning of February 12, and show that the same search on both Sina and Tencent Weibos is now returning no results, just a notice saying that search results may be illegal and cannot be displayed. March 19: A document entitled "Report on the Investigation and Assessment of Wang Lijun's Personal Visit to the American Consulate in Chengdu" (王立军私自进入美国驻成都总领馆并滞留事件进行调查评估的通报) begins to circulate on the Internet. March 31: The Economy and Nation Weekly publishes an article entitled "Dalian Shide's Missing Officer" (大连实德迷局) stating that on March 15, Xu Ming had been subjected to "controls by relevant government agencies" on suspicion of involvement in a "economic case." The screenshots above show that on April 4, Sina's and Tencent's weibo microblogging platforms were censoring searches for "Xu Ming" (徐明). April 10: Bo Xilai is suspended from his Politburo and top Communist Party posts. China announces Gu Kailai is being investigated for Heywood's death. 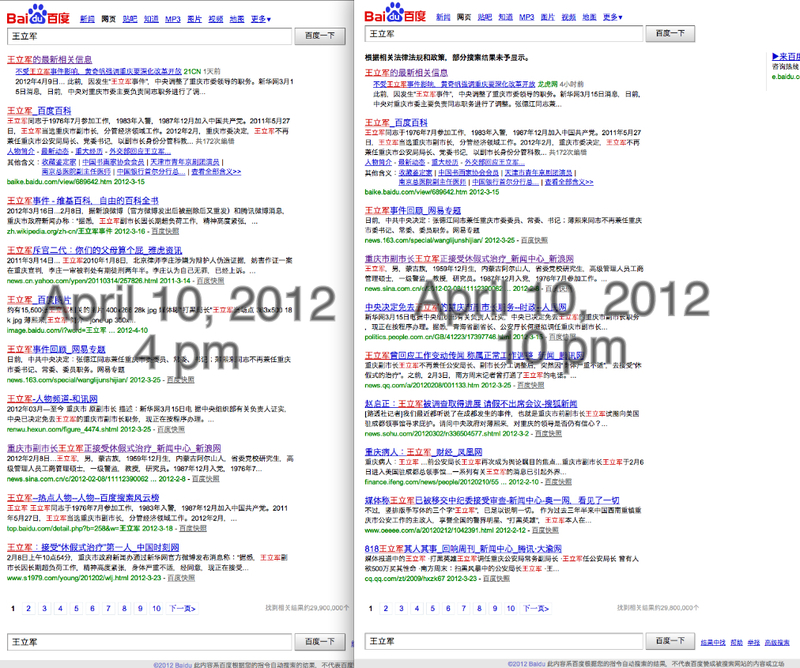 The screenshots show that a search for "Wang Lijun" (王立军) on Baidu at around 4 pm on April 10, 2012 returned results from foreign websites like Wikipedia and Yahoo.com. The same search done at 10 pm the same day now includes a notice saying "In accordance with relevant laws, regulations, and policies, a portion of search results have not been displayed." (根据相关法律法规和政策，部分搜索结果未予显示。), and the foreign websites are gone. 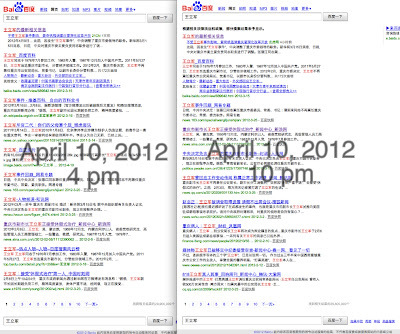 This screenshot shows that on April 11, Sina Weibo was once again censoring searches for "Wang Lijun." May 22: The state-sponsored Global Times publishes an article entitled "Hong Kong Media Reports Wang Lijun May be Tried Next Month for Treason, Trial to Take Place in Chengdu" (港媒传王立军或下月被起诉叛国罪 审理在成都进行). These screenshots show that by the following day it had been deleted. July 22: Wang is formally arrested by the State Security Bureau of Chengdu for defection after the Chengdu Municipal People's Procuratorate approves the arrest. August 2: After the investigation is completed, the case is handed over to the Chengdu Municipal People's Procuratorate for examination before prosecution. September 24: The Chengdu Intermediate People's Court finds Wang guilty of bribe-taking (受贿 - 9 years), abuse of power (滥用职权 - two years), defecting (叛逃 - 2 years), and “bending the law for selfish ends,” (徇私枉法 - 7 years) and sentences him to a term of 15 years imprisonment. 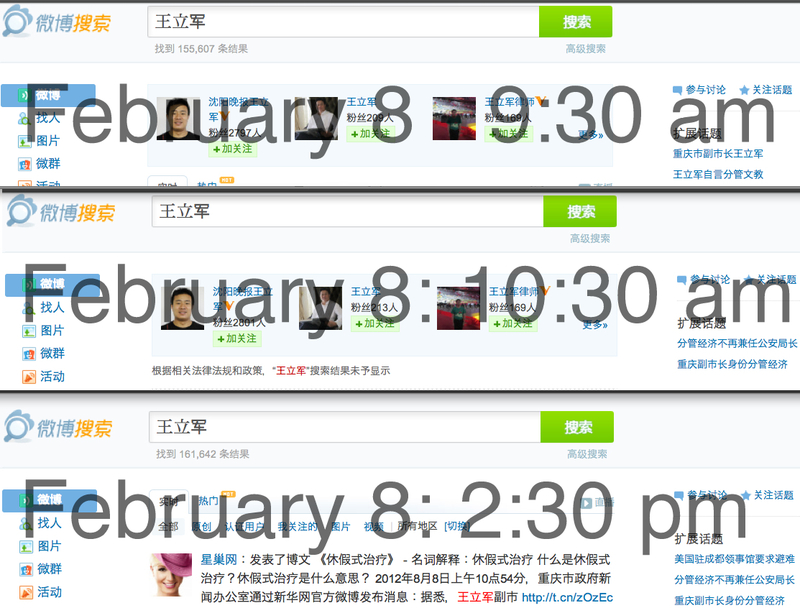 These screenshots show that Tencent Weibo stopped censoring searches for "Wang Lijun" within hours of the court announcing the verdict. 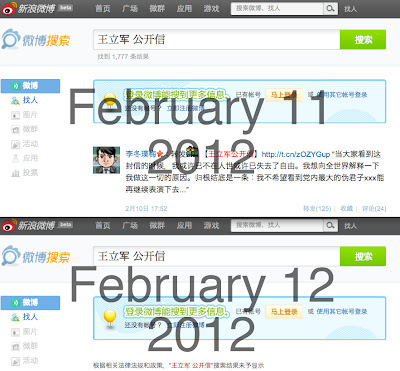 Sina Weibo also stopped censoring searches for Wang's name at about the same time as the verdict was announced. Sina Weibo Censors "Boycott Japanese Goods"